You’re just coming off your McKenzie Part B course and likely excited to get back in the clinic with a renewed sense of energy to apply all you’ve learned! Yet, with all the good intentions and valiant efforts, we often still miss the mark in our attempts to be proficient with our mechanical exam and treatment. And, what we often come to realize is that this endeavor to master this assessment method is more like a marathon than a sprint. We realize that regular study and reflection, patient-after-patient, is needed to steadily improve. We also come to realize that the more we surround ourself with others who are devoted to improving and further along in their journey or further trained, the better we become. This realization is one of the reasons I started the podcast and expanded the project with Case Conversations. So, in the same spirit and in order to keep your skills up and your knowledge current, I'm offering you a free case from Case Conversations. 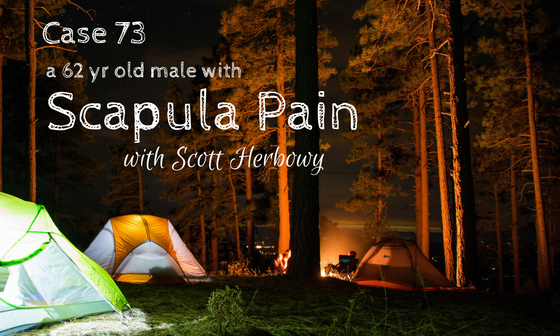 This is a hand-selected case with Scott Herbowy highlighting a patient with scapular pain, perfect for right after your Part B course. With Case Conversations, each month you'll receive new cases with veteran clinicians - some of the best trained clinicians in the world! They'll dissect the history and physical exam findings and then explain how they clinically reason through the patient responses. They’ll share why they made this decision over another, how they educate the patient to head off losing a patient, how they manage each condition and more and more. Subscribers of Case Conversations sharpen their history-taking, increase their confidence, and improve their outcomes. So, accept my invitation and sign up to receive this free case and enjoy!